Policy on Information Disclosure | UBE INDUSTRIES,LTD. UBE's investor relations (IR) activities are dedicated to earnestly educating equity markets about our management strategy and business situation. We strive to disclose information in a timely, appropriate and fair manner to increase the transparency of our management, and earn the confidence of equity markets. UBE actively engages in mutual communication with parties involved in equity markets, such as shareholders, investors, and securities analysts. These efforts are aimed at closing the recognition gap and receiving feedback for management, with regard to the perception of UBE and rating in equity markets. UBE is committed to achieving compliance with the Financial Instruments and Exchange Act and other related legislation, and discloses important corporate information in accordance with rules for timely disclosure prescribed by the Tokyo Stock Exchange (TSE). 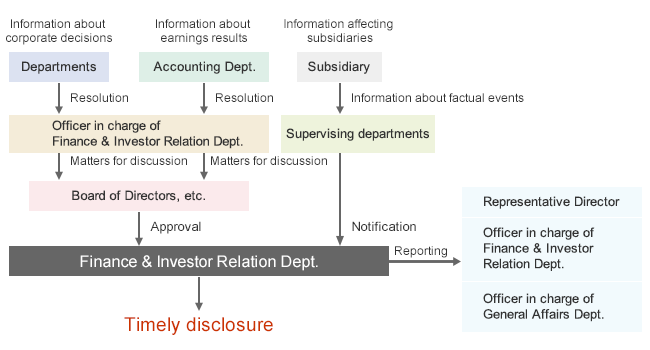 Furthermore, it is our basic policy to pursue active and fair disclosure of information that we deem to be useful in helping shareholders, investors, and other stakeholders to understand the Company, even beyond the scope of TSE rules for timely disclosure. Information that is designated by TSE rules for timely disclosure is published through TDnet operated by the TSE, and issued to press clubs covering the Tokyo area and Ube region. We endeavor to rapidly publish the information we disclose on our website. We also strive for fair and broad information disclose through our website and media channels, for information that is beyond the scope of TSE rules for timely disclosure.